In the Ltchashen village of the Gegharkunik Region, some 100 kilometers eastof Yerevan, 65 year old Paytsar Grigoryan runs from house to house administering vaccinations to children before the medicine can spoil. She has no way of keeping it fresh, and there is not even a window in what used to be the village medical outpost. Paytsar has been a nurse for 50 years, and remembers when the Soviet system managed an efficient clinic in Ltchashen. But while those days have gone, Paytsar has stayed, as her village’s link to medical care. But without so much as the light by which to aim a needle, the senior nurse instead goes from house to house. In small villages like Ltchashen, lone nurses administer vaccinations and injections prescribed by doctors, deliver babies, and are on call for emergency. As the village health-care provider, 65-year old Paytsar Grigoryan with 50 years nursing experience is paid 5000 drams (about $9) per month. The Belgian division of “Medecins Sans Frontieres” (Doctors Without Borders) has begun a five-year program aimed at improving the state of ambulatories and medical treatment. It also includes providing hospitals and polyclinics with medicines and medical equipment. But, waiting for those improvements, Paytsar’s situation is not unique. Nurse Nune's apartment has become an ambulatory. ArmeniaNow visited four villages in the Vardenis district and found, at best, dilapidated clinics. In two villages, Aghbiuradzor and Kakhakn, nurses use their homes as medical stations. The list of vaccinations is attached to the wall of the house of Kakhakn nurse from Nune Vatyan. “I give injections to little newborn babies at their homes but injections to one-two year old children I give here,” says Nune. 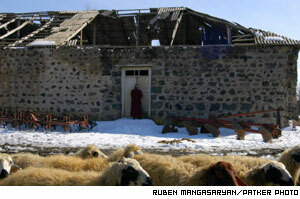 Refugees from Azerbaijan live in Kakhakn, which has a total of about 530 residents. Nune also delivers babies. This year she has delivered three babies out of five that were born in the village. The two she didn’t deliver were first-borns. She believes the mother’s first child should have a proper delivery, so she insists that her patients go to the nearest hospital, 10 kilometers away in Vardenis.